On March 14th, Annie’s 12th birthday and 3 days after the Great East Japan Earthquake, I woke the kids at 5:30 a.m. and we left our apartment for Narita Airport. 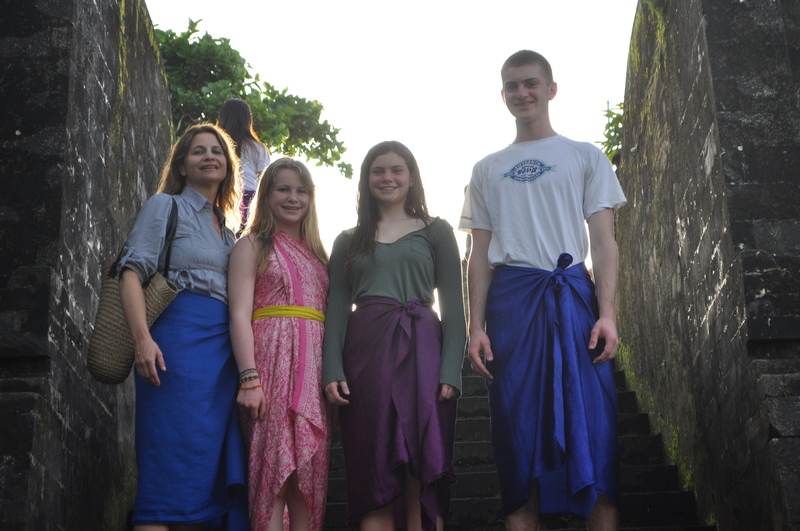 Our plan was to get on the morning flight to Bali, a week before our planned spring break vacation. We didn’t have tickets for the 14th but with the aftershocks constantly rolling underneath us, the unknown nuclear reactor situation and the closing of the kid’s schools, Tom and I thought it best I take the kids and leave. It took a lot of time and yen to get on the flight but with tickets in hand we ran to security to make it on the 11am flight. Standing in line at immigration, there was a very large aftershock – so big that everyone left the line and ran for cover. If you’ve ever been in Narita’s immigration room, you’ll know there really is no such thing. So after we got Sophie out from under the huge piece of glass hanging from the ceiling, we waited for it to stop and continued to the gate. We boarded the flight a few moments before its scheduled departure. Usually I hate to fly and have to take a few pills to relax in my seat. This trip, I thanked god when the wheels left the ground and for the first time in two decades, the turbulence didn’t bother me. We landed in Denpasar seven hours later, tired and relieved, yet sad to have left Tom behind. The taxi drove for over an hour through crowded streets, where motor scooters outnumbered cars ten to one. The ride was one we had never taken and the stimuli blew by us at 80 kilometers per hour. We were glued to the windows taking it all in. After days of worrying and stress, the new surroundings were a huge relief, something to take our minds off what we had just been through. We arrived at our hotel in Ubud, dirty and hungry, and the warm welcoming people who took our bags and led us to a table outside by the jungle were like a vision. We ordered huge amounts of food and ate it all – they were even there with a cake and a candle for Annie – a birthday she will never forget. The relief we felt that we were safe in Bali was palpable and I’m pretty sure none of us had a problem falling asleep that night. We spent ten days at that hotel, taking full advantage of everything Ubud had to offer – white water rafting, bike rides through rice paddies, yoga, monkey forests, nighttime rides on elephants, laying around by the pool, massages, authentic Balinese food, shopping, playing cards and numerous games of Bananagrams – cocktail hour under the thatched roof bar – smoothies made from fresh tropical fruits. We fed our minds, bodies and souls and we talked a lot about what happened and our lives back in Tokyo. We worried about Tom and talked to him often. We went over tons of What If scenarios and facebooked our friends to see what they were feeling and learn of their plans for the future. This vacation was like no other and will forever be melded with the earthquake. I am so grateful that we were able to go and I’m truly thankful to all of the wonderful people in Bali who cared for us – hopefully we’ll have the opportunity to one day return under better circumstances. Namaste. You are so brave. You are the most worldly of all us Lipskin’s and most of all, you and Tom are wonderful parents. Next An Unexpected Love of L.A.